You can RSVP for an event directly from e-mail reminders. Just click on the appopriate button at the bottom of the e-mail. Members of your club can also navigate to their personal account by going to the Edit My Account tab on the home page of your website. 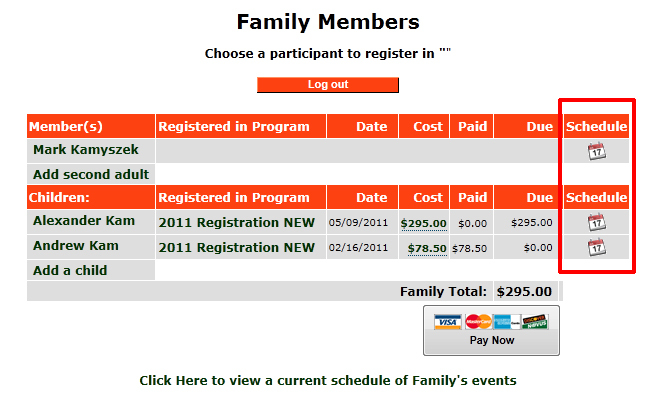 Once logged into their family account, they will see schedule icons to the right of each individual. Clicking on the schedule icon will display each participant's schedule for teams they are associated with. Once the member has clicked on their schedule icon, this will display a list of the events they are involved with, and they can select whether they are "Attending" or "Not Attending." Selections made here will be visible to the team manager and coaches when accessing the team Attending section on the Schedule page. So if a member knows they will be away for a certain week, they could make this selection well in advance to notify the coaches and managers.